Quality DNA Tests offer you a complete DNA paternity test service in Mississippi that provides the highest accuracy paternity results in just a few days. 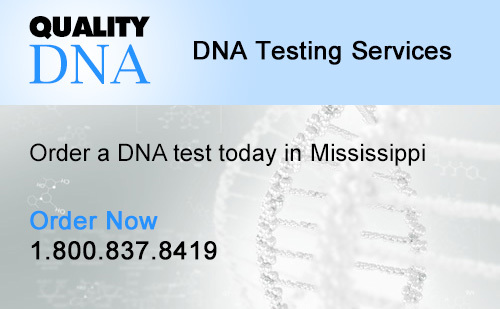 Many testing locations in Mississippi that provide the highest quality DNA testing and results. Call today to setup your DNA test in Mississippi with a DNA testing consultant. Our staff can setup your paternity test in just a few minutes over the phone. We provide the highest level of privacy with quality DNA testing. Your information is always 100% safe and protected. Quality DNA Tests follows the strict guidelines and regulations ensuring the highest quality DNA test with private results. Call 1-800-837-8419 now to order a Mississippi Home Paternity Test or Mississippi Legal Paternity Test. Get results in as little as 3-5 business days. Let our expert team of DNA testing experts in Mississippi help you with your order. More information on Mississippi paternity testing laws.